A Noise Marines army on Warhammer Tau? Actually, I forgot to bring my Tau with me to James's place today, so I had to borrow his Chaos army for a game. 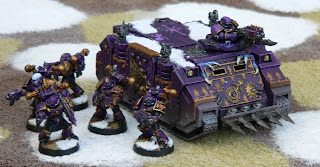 Now, as someone who was formerly a follower of the 'ruinous powers' prior to embracing the 'greater good' of the Tau Empire, I thought this would be a great way to try out the Noise marines army I'd had forming in my mind. Unfortunately, James doesn't have the army I wanted, so I proxied it using miniatures from his currently shelved Thousand Sons army. As you can see, this army is really thrilling on paper -not! In truth I wanted to take what I'm convinced is the only way to play Chaos competitively without Plague Marines. But if you want to be really cheesy, simply swap the Noise Marine squads for Plague Marines squads with 2 plasma guns and a champion with a powerfist. Anyway, we played 2 games. First game was disastrous for me as I hadn't really figured out the army and it made me realise how comfortable I've become playing my Tau. Second game was disastrous for James (despite my terrible dice rolling), which led to a solid victory for the powers of Chaos. However, the army is incredibly boring to play, isn't quite as versatile as my usual Tau mechanised force and made me realised why I stopped playing Chaos Marines in the first place...other than the comical failure of armour saves. While I've always loved the look and feel of Chaos (and cackling madly to myself), the force seems like a bit of a gimmick, a bit of a one-trick-pony -essentially not a 'real' army. Orks (for example) are a real army, because you can imagine picking a huge variety of things from the Codex and creating all manner of forces from hordes of boyz on foot to speed freaks, battle wagon krumpanies and the like. I can't imagine anyone playing an Apocalypse game with a Chaos army due to the limit of viable units. Even then, I regard the Chaos space marines army as depicted in the 4th edition codex which revolves around the Traitor Legions from the Horus Heresy, not random chaos renegades. No chaos purist would ever contemplate mixing plague marines, bezerkers, noise marines and Thousand Sons in a single army. They'd murder each other before they even got to the enemy! So while I continue to contemplate a second army to compliment my Tau, I'm sad to say the Chaos Marines shall not be it. Although it was refreshing for James not to march his Space Marines straight down my throat, which is what usually happens when I'm playing Tau. I hear you on the Chaos marines. The Elites are 'meh'. Dreadnoughts are insane, Possessed are inferior to Berserkers, Terminators need Fearless badly, and...chosen are okish. Most Chaos armies pretty much ARE troops and heavy support with some HQ mixed in. For mixing, I think you can come up with an explanation for why troops might mix. Chaos Undivided, anyone? Black Legion? Even a temporary alliance? Even then, Chaos cult troops are often pretty mono-tasked; I mean, Noise Marines? Only anti-troop. Zerkers? Melee only. THousand Sons? Anti-infantry only. PLague Marines? Durability only; a bit of love with melta at least. I think that the less-well-written codices end up distilling into a very few playstyles. While, for example, Guard has a few popular builds? Thing is, they can get all sorts of USEFUL capabilities in their various force org slots. I'm coming to like my Tau, but I think Tau have some issues with utility in any unit not a Crisis Suit. There's 'hide the Fire Warriors', kroot utility, and then getting elites and heavy support to do the heavy lifting. Yeah, I have to agree, Chaos isn't what it used to be. I have been struggling to build a list that is competitive and not some boring cookie cutter. I have been having some success with spamming basic CSM's and backing them up with Zerkers. If it weren't for all the effort I put into nifty conversions and my color scheme, I'd have sold them ages ago. Dezartfox: I just dashed out the door once the washing was done, because I was late. Raptor: Yes, Tau do have similar issues, but they're not quite as bad. I think that chaos offers more people just don't try out the units that seem ho hum on paper. I love taking Lesser daemons, they have won many games for me, they count as troops and cost 65 pts for 5 and don't count against your force org chart. Deep Strike and assault in the same turn. If they deep strike with in 6 inches of an icon they don't even have to roll the scatter. I never run Daemon Princes they are to expensive and die very easily. I like Lords in Rhinos using the hatch for the lash. (If I am using Lash) I have found that when I don't run Lash people get confused and don't know target importance any more. They are so used to trying to kill the lash first. Spawn are sweet, until you run some you will have no idea how great they are 1d6 attack per model T5 S5, 9 models 9d6 attacks move 6 inches assault 12 inches and mindless fun unit to play, they are tank killers. The defiler is also a great unit it either draws way to much fire or not enough and can turn the game by itself and if i dies early is no big loss. I also love the greater Daemon they appear out of nowhere and are divesting to the enemy if they come in on any turn other than 2 also a great tank killer. I also think that the icons have a way of tweaking any army into something unique, It makes every unit more versatile in setup options. My current favorite option is Terminators with lightning claws and the Icon of Khorne assaulting out of a Land Raider 4 attacks each 5 when assaulting and rerolling to wound. I know someone else who runs them with the Mark of Tzeentch(sp) for the 4+ inv save and use them a lot like Legion of the Damned.